"After a disappointing 1926 season, which, according to the Wakefield Town Report was not particularly successful because of the choice of plays, Coach Homer Shellenberger put the following team on the field, (front row, from left to right) G. Buckle, M. Ball, G. Churchill, C. Wilkinson, E. Marshall, C. Melanson, S. Szydlowski, D. Winkler and F. Minardi. (Middle row, left to right) Coach Homer Shellenberger, D. Dutton, R. Hayes, B. Colpitts, W. Walsh, H. Galvin, E. Messer, Manager L. Gardner. (Back row, left to right) J. Climo, W. Allyn, F. Newman, T. Duggan, D. Snowden, and A. Hovey. Coach Shellenberger was inducted posthumously into the first Wakefield High School Athletic Hall of Fame in 1991. He also was coach of the baseball team. " -- Text from calendar by Jayne M. D'Onofrio. 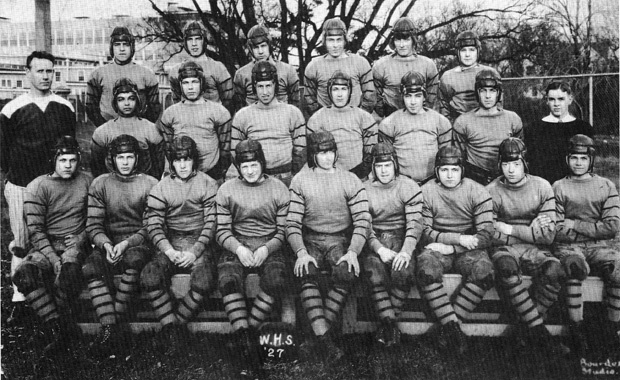 “Wakefield High School, football squad, 1927,” NOBLE Digital Heritage, accessed April 20, 2019, https://digitalheritage.noblenet.org/noble/items/show/7138.